This week's bitter cold snap killed about half of Washington's beloved cherry blossoms, and the survivors are now expected to peak at the end of next week, the National Parks Service said Friday. 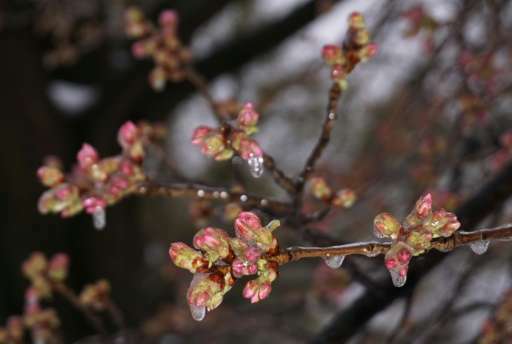 Freezing temperatures that had abruptly followed unseasonably warm weather had the nation's capital fearful for its more than 3,000 prized Japanese cherry trees, a major tourist draw. The mercury dip to about 23 degrees Fahrenheit (-5 degrees Celsius) "killed virtually all of the blossoms that had reached 'puffy white'"—the late stages of the bloom cycle—NPS spokesman Mike Litterst said in a statement. He had told AFP earlier this week that the damage would begin when the temperature dropped to about 27 degrees Fahrenheit (-2.5 degrees Celsius). Litterst said the other half of the cherry blossoms were at earlier stages in the bloom process, and just five percent of those appeared to be damaged. "Peak bloom"—the time when 70 percent of the Yoshino trees are in full flower—around Washington's Tidal Basin is now difficult to predict because the death of so many blossoms has distorted NPS models. But using historic data and current forecasts, horticulturists are anticipating the peak to come "sometime next weekend." The NPS had been expecting peak bloom to fall between March 19 and March 22. Hundreds of thousands of people come to the US capital to see the clouds of pink flowers each year. The National Cherry Blossom Festival is a top tourist draw, bringing in tens of millions of dollars. The festival commemorates the 1912 gift of roughly 3,000 cherry trees to Washington by the mayor of Tokyo, as a symbol of US-Japanese friendship. Well, there is something else for those (vary objective??) President Trump haters to blame on him. Funny thing is they have lost so much rational thinking they will really believe it is his fault. :-) Talk about being blind. Name source where anyone is blaming this on Trump. Go on. We're waiting. Why did I assume I would find such shallow posts? History? And once again, "vary" is spelled "very". Look up what happens when complex systems are perturbed. They oscillate until they reach another stable state, perhaps one not conducive to our presence. "Must be AGW, there is no other conceivable answer." While trying to be sarcastic, you may actually be right. The cherry trees blossomed early because it was unbelievably warm again this winter, including hitting 80 degrees F in February! This is so bizarre that it fooled the trees into blossoming way too early, so that when seasonal weather finally returned many of the blossoms froze.